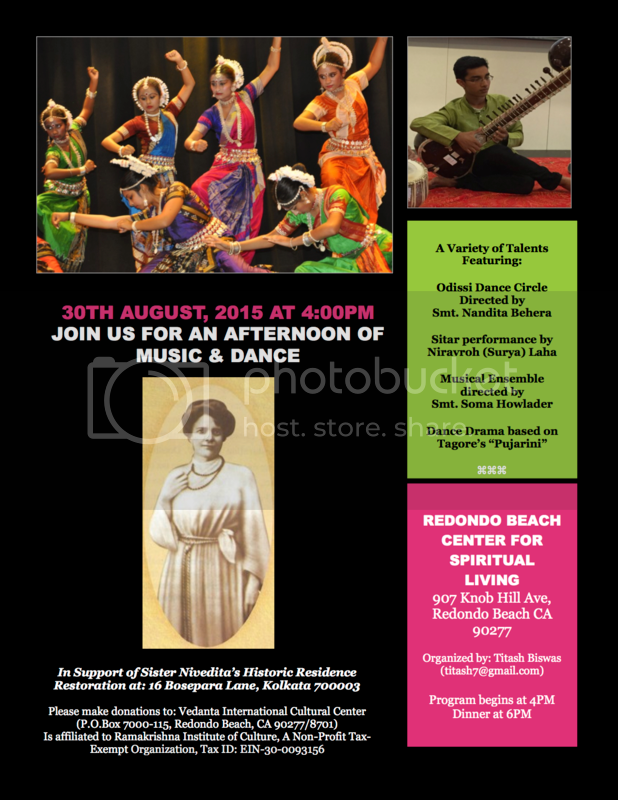 It is our pleasure to forward you this invitation to VICC's "A Child's Gift to Sister Nivedita - an afternoon of Music and Dance", on Sunday, August 30th. from 4:00 PM to 6:00 PM at Redondo Beach Center of Spiritual Living, 907 Knob Hill Ave, Redondo Beach, CA 90277. An ethnic Indian dinner prepared by the VICC Volunteer Chefs will be served after the show. VICC youth, Titash Biswas, a 15 year old school student is organizing this charitable show to raise funds for the restoration of Sister Nivedita's historic residence at 16, Bosepara Lane, Kolkata. View article on the Statesman. We whole heartedly support this event and request you to support as well. Please take a look at the details below.